Des Monies, IA resident Kelsi, aka "Khans" from Scionlife.com, is pretty into her Scion xD. How into it? She's got custom wheels, exterior vinyl graphics, and unique interior and engine bay bits. 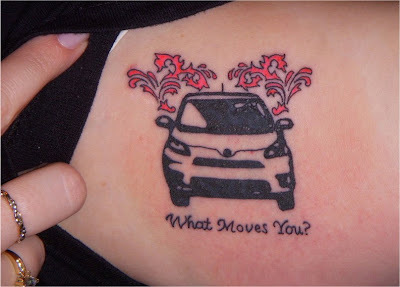 Oh yeah ... and a Scion xD tattoo. The ink, located on the inside of her left bicep, matches the graphics on her xD. "I actually got the tattoo first. It holds a lot of meaning, not just the car itself ... the Scion brand has done a lot for me. I know some don't like it, but that's cool. It's not for other people." Well there you go: Custom car and matching custom ink. Let's hope the car is good to her!